In some parts of the blogosphere it is always April 1st, but not among the Beaker Folk of Husborne Crawley. Their Archdruid Eileen has taken on the serious subject of Yet more Bible Translations, and I have taken this subject up at Better Bibles Blog, in a post Introducing Crumpe Bible Paraphrasers. Contents of the ancient lead books revealed! 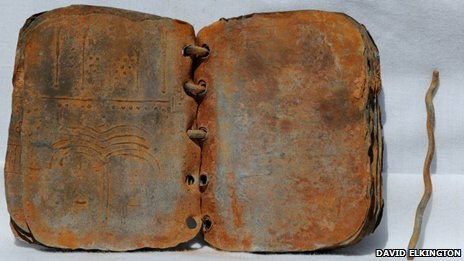 On Tuesday I reported on what was being billed as “the major discovery of Christian history”, a new discovery said to be “as important as the Dead Sea Scrolls”: 70 books made of lead, said to be from the 1st century AD and of Christian origin. Today I am excited to read about the contents of these books, which have been revealed by Alan Knox at The Assembling of the Church. Thanks to Jeremy Myers of TILL HE COMES for the link. This is indeed a sensational revelation, fully justifying the hype “the major discovery of Christian history”. It seems that these books contain the oldest and most reliable texts of much of the New Testament. And these texts differ from the ones we have had up to now in some startling ways. Read Alan’s post to find out more. Now of course Alan’s post completely contradicts the one by Jim Davila supposedly proving that these lead books are forgeries, which I quoted in my earlier post today. But both Alan’s and Jim’s posts are dated April 1st. Which of them is an April Fool? I will leave it for you, my readers, to decide. Google has today announced the beta version of their new Gmail Motion product, billed as “A new way to communicate”. The basic point is that a webcam, now built into most laptops, can be used detect and analyse users’ gestures, and these can be used to control the Gmail program – so rendering obsolete the keyboard and mouse. Thanks to The Church Mouse on Twitter for retweeting this announcement. Will this product really revolutionise the world? Or will it prove as ephemeral as a mayfly in April, or as some previous Google announced products like Google Animal Translate? Maybe by tomorrow we will be able to give it a more serious evaluation. Seriously, there is a real idea here. A webcam can surely be used to follow fingers and so replace a mouse or a trackpad, just as on a touch screen smartphone, although the resolution of current webcams may be insufficient. Decoding of more complex gestures, perhaps even of sign languages for the deaf, would surely be possible in principle. But in practice this may prove just as tricky as voice recognition. So I won’t be throwing away my keyboard and mouse just yet. The BBC reports that an earthquake hit Blackpool in north west England at 3.30 this morning. So far there are no reports of damage or casualties, but it is still early. 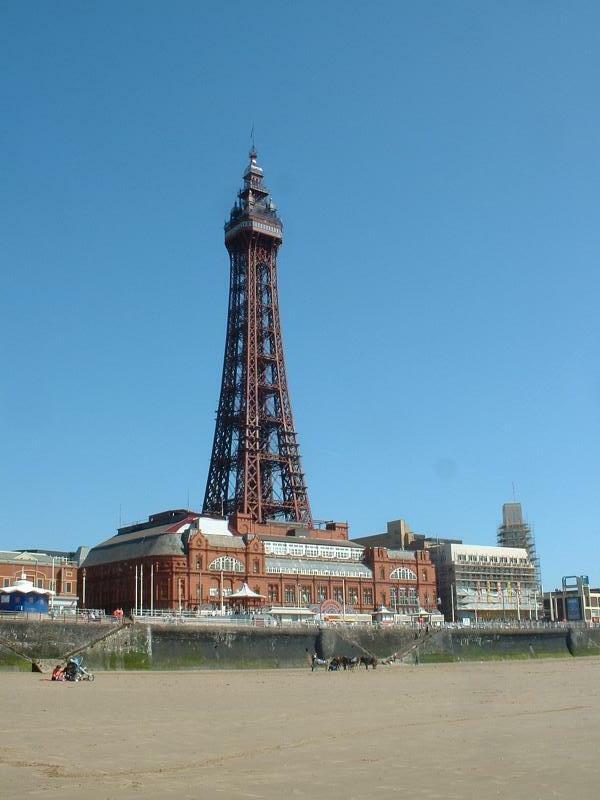 The iconic Blackpool Tower is believed to be still standing. But as this is a low lying coastal area we can only hope that there will not also be a tsunami. We are safe 40 miles away in Warrington. So has Mark Stibbe’s prophecy been fulfilled? Or is this an April Fool? Probably neither. I’m sure the BBC report is genuine, and I have added nothing but speculation. But “the 2.2 magnitude tremor” was very slight, and the real reason for no reports of damage is that very likely there wasn’t any. Also Wikipedia lists several earthquakes more powerful than this in the UK each year, including two already this year. So there is no prophetic significance to this morning’s event. Language is one of our biggest challenges so we have targeted our efforts on removing language barriers between the species. We are excited to introduce Translate for Animals, an Android application which we hope will allow us to better understand our animal friends. We’ve always been a pet-friendly company at Google, and we hope that Translate for Animals encourages greater interaction and understanding between animal and human. Will this service really work? Automatic translation for human languages still has such a long way to go that I can’t really see it working into animal languages. When we look at Bible translation, machine translation into human languages is not really feasible. So I don’t see much chance in the near future, even with the power of Google behind the project, of Bible versions for our cats and dogs. Indeed I wonder if this whole project is likely to be a one day wonder which people should really be laughing at. The last bastion of complementarianism collapses! I was astonished this morning. At my church the last bastion of complementarianism, of separate roles for men and women has collapsed. No, we haven’t appointed a woman pastor yet – although we probably have a 50/50 chance of getting one next time round. It’s something far more radical, perhaps even unique. We have appointed a MAN to be in charge of the flowers in church! I’m sure my friend James, who grows flowers as a hobby, will do an excellent job. The leaders of The Episcopal Church (TEC – the historic Anglican church in the USA) may seem to be rushing headlong, like the proverbial lemmings, into self-destruction, as a church and as a part of the Anglican Communion. See what I wrote about them in my posts The end of the Anglican Communion as we know it? and Anglicans and Anglican’ts. But now, it seems, not content with this, they are asking to be thrown quite literally into the sea – at least, to be expelled from North America as stateless refugees. The Queen must apologize for the wrongs committed by Henry VII and repudiate the “Christian Doctrine of Discovery,” the 76th General Convention of the Episcopal Church has declared. What this means is that our monarch is supposed to repudiate the claims made by her ancestors to dominion and title over much of North America, and recognise instead that these lands remain the possession of the native Americans from whom they were grabbed. But did the bishops and delegates who adopted this resolution understand its further implications? If, as they seem to demand, the whole of North America is returned to its rightful owners, the native Americans, what place is there for that huge majority of modern North Americans who have European, African or Asian ancestry? What would their new native American rulers want to do with these invaders who illegally dominated their lands for nearly four centuries? While they might allow to stay those who could prove some native American ancestry, they might very reasonably require the others to leave and return to their countries of origin. Some of the countries of origin of today’s US and Canadian citizens might be happy to have them back, at least if they were able to bring their wealth with them. But I suspect that the majority of Episcopalians and Canadian Anglicans would trace much of their ancestry back here to the UK. After all, why else would they be Anglicans? The Canadians might be welcome here. But would we welcome back to these shores tens of millions of the descendants of those who rebelled against our Crown in 1776? I suspect not. At the very least our Queen would be entitled to demand an apology from these people in return for the one they demanded from her – an apology for their unilateral and illegal assertion of dominion and title over lands claimed by her ancestor George III. These lands might have rightfully belonged to the native Americans, but they never legally belonged to the rebellious immigrants who set up their own laws to further dispossess the rightful owners. So, if the apology demanded from the Queen is actually put into practice, the majority of TEC members might find themselves literally afloat in mid-Atlantic, turned back from any ports their ships try to dock at. Is that what they really want? With TEC, who knows!